Prime Minister Nguyen Xuan Phuc has required every sector to build quarterly growth scenario completed with specific plans, solutions and task assignment, to submit to him before the Lunar New Year (February 16, 2018). The PM made the instruction at the regular Cabinet meeting on February 2. He also stressed that the Government’s intention to build project on the sharing economic model in Vietnam is necessary for the proactive and effective implementation of the model. He assigned the Ministry of Planning and Investment to coordinate with related ministries and agencies and collect recommendations from international and domestic experts on the project. PM Phuc noted the positive socio-economic situation in January which creat a momentum for growth into the year. At the same time he reminded that economic development is a “marathon”, and how far the country can run depending on efforts to reform and innovate as well as the resolve to rise above oneself. The PM underlined the fact that major economies around the world such as the US and China are reshuffling their economic management mechanisms and measures through adjusting taxes and interest rates, which requires Vietnam to make timely response so that its economy can have greater strength to better cope with impacts of the integration process. He urged ministries and sectors to closely follow world situation, especially issues related to markets and trade protection in order to make faster policy response. “We need more timely response in the current world situation in both economic and socio-cultural aspects,” PM Phuc said, adding that Vietnam should also create a new investment and business environment for breakthrough development. He also stressed the importance of suitable institutions and the media’s role in strengthening confidence of the public and investors. The PM again requested more efforts to reduce business costs in 2018, including the continued revision and reduction of interest rates and fees, such as transport and logistics fees. He instructed the Ministry of Transport to consider suitable fees for BOT (Built-Operate-Transfer) transport projects which ensure fair interest of the State, investors and the community. According to the PM, the Government will hold several thematic conferences in the first quarter while monitoring the outcomes of previous conferences to push forward the implementation of policies and measures set by the Government and the PM. 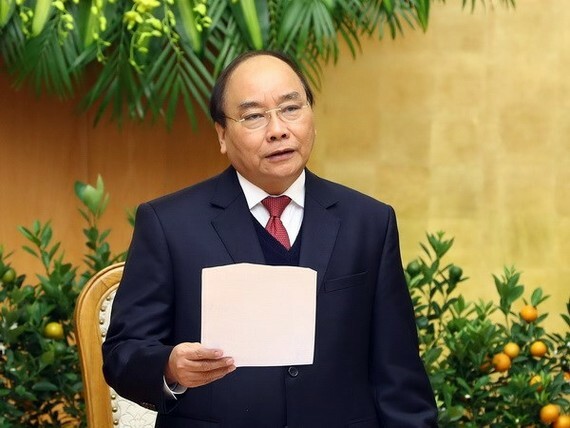 Mentioning the approach of the Lunar New Year, PM Phuc urged the defence and security forces to ensure national security and public order and safety across the country. The government leader required ministries, agencies and local administrations to set out immediately at work to implement tasks and plans of 2018 without wasting time on spring festivals.